Psst! Want to hear a secret for finding cheap lobster in Maine? If you'd like to buy live Maine lobsters to cook while you're staying in Maine, to transport home or even to arrive on your doorstep if you can't get to Maine, here's a quick tip. The best (and surprisingly cheap) live lobsters come from the Pine Point Fisherman's Co-op, also known as the Lobster Co-op, in Scarborough, Maine., a resort town on the southern coast near Old Orchard Beach. You can't leave Maine without seeing dozens of signs advertising lobsters for sale. You can even buy live lobster at rest areas (but beware of the inflated prices). 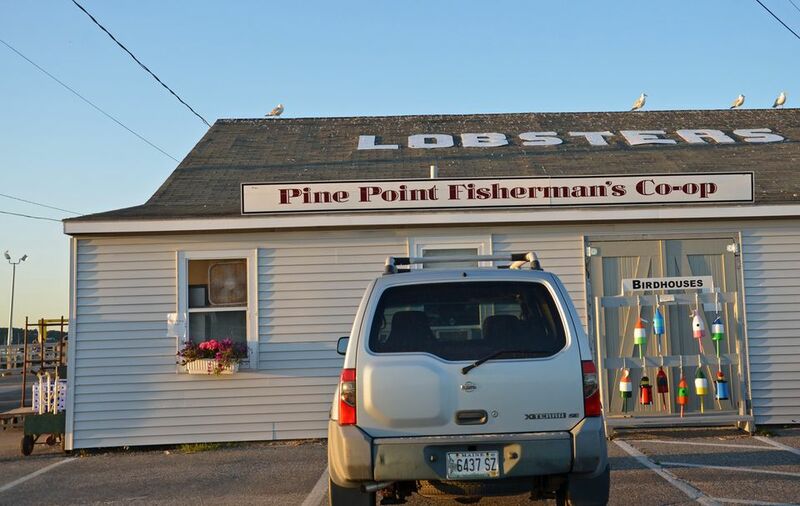 When you spot the Pine Point Fisherman's Co-op building with the word LOBSTERS emblazoned on the roof in large letters, though, you'll know intuitively that the lobsters here will surpass those you can obtain from other shops and roadside stands. You'll realize you got a great deal when you feast on the Co-op's sweet and delicious 1- to 1.25-pound "chicken" lobsters. Lobsters over two pounds, while admittedly tempting, can sometimes be tough and less tasty. Freshness has a lot to do with the quality of the lobsters. About 25 boats participate in the co-op, which has been in operation for more than 40 years. In addition to operating a retail outlet in Scarborough, these hard-working lobstermen also sell lobsters and fresh mussels direct to consumers via the lobstercoop.com website. If you can't get to Maine and want to order lobsters live or partially cooked for delivery, you'll find the co-op's prices are cheap in comparison to other online lobster sellers. It's good to know that online ordering is available. Even though bringing lobster home helps, it's still easy to miss Maine... and to crave more lobster... after you've consumed the last morsel. Hours: The Lobster Co-op is generally open to the public from 10 a.m. until 6 p.m. daily. Weather conditions can affect operating hours, selection, and prices. Call ahead to confirm hours or if you need to place a large order. Contact: To order lobsters for delivery, you have three options. Email the Pine Point Fisherman's Co-op at lobster@maine.rr.com, visit the lobstercoop.com, or call 207-883-3588. Restaurant: Want to eat lobsters on-site? You're in luck! The Rising Tide Restaurant is located on the water behind the Pine Point Fisherman's Co-op, and you'll have an ideal view of lobster boats in the harbor while you're feasting on fresh seafood. Directions: The Pine Point Fisherman's Co-op is located at 96 King Street in Scarborough, 3 miles from the Old Orchard Beach Pier. From US Route 1 in Scarborough, turn onto Route 9 West/Pine Point Road. In about three miles, after passing the Clambake Restaurant (another landmark spot for lobster lovers), turn left, then make an immediate right onto King Street.